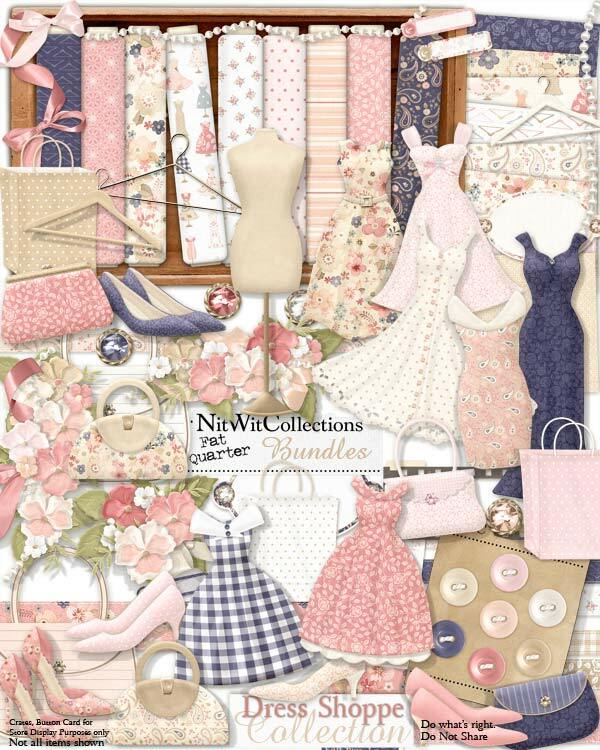 "Dress Shoppe" Collection is a wonderful array of chic papers and elements to show off your elegant side! That "perfect dress" for the occasion is definitely in your "computer closet" now, and I've even included shoes, a purse and a pearl necklace to match. Think of the layouts and cards that you can create to remember a special event such as a prom, a date, a wedding or some other day where more formal attire was the style. You don't need to make room in your closet for this shopping trip, just use your imagination and you're set for stylish results! 4 Bows - in a fashionable digital "fabric"
7 Dresses, all in different styles, patterns and colours. It's an easy shopping spree and you don't even have to check the price tags!! 1 Dress form to hang your beautiful purchase on....no hemming required! 1 Film frame strip - you know that you have take photos when you look this good. 2 Journal squares in the shape of a purse....journal about this special layout or card...it's one of the reasons we love this hobby! 10 Ribbons to dress up any part of your layout or card! 5 Shoes - duplicate these to make a pair....and no one will ever say you have too many shoes! 4 Shopping bags - how else will you carry your purchases?